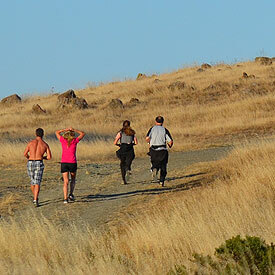 Join Ranger Elia Narayan for a sweat-inducing hike up and around the Pacheco Valle Preserve. Prepare to get your body moving and heart pumping. This event is ideal for ages 15 and up. Degree of difficulty: Strenuous. Wear comfortable athletic clothing and sturdy shoes. Don’t forget to bring water and snacks. Friendly dogs are welcome but must be leashed. Rain will cancel. RSVP's are appreciated but not required. Questions or to RSVP: Contact Supervising Ranger Elia Narayan at ENarayan@marincounty.org. Directions: Meet at the gate at the bottom of Chicken Shack Fire Road. From Hwy 101 in Novato, take the exit for Nave Dr. Turn right onto Nave Dr and continue over the freeway. Turn left onto Alameda del Prado. The gate is on your right.